She’s been dreaming of dancing in the Alps, chiffon saris and Yash Chopra films — in that order — ever since she can remember. Now that she’s seen the Alps and has plenty of chiffon, there’s just one ambition to pursue — star in a Yash Chopra film. At this point, however, the Atlanta born-and-bred Gayatri Patel would have to make do with the small screen. A few months ago when she arrived in Mumbai all she had for recommendation were her good looks, grit and parents’ blessings. Now she has a lot more to flaunt. She’s landed not one but three music videos. The first is Bappi Lahiri’s Mashooqa opposite Jugal Hansraj with two untitled ones to follow. And she’s awaiting a film call — preferably from Yash Chopra. But wouldn’t Hollywood have been closer to Atlanta? "Yes, that too figures in my plans but I wanted to give Bollywood the first shot. Here they like young and fresh talent. I am confident of making it." Why not? If one Gayatri could make it in Swades, surely they’ll lay out the red carpet for her namesake from pardes. He is the egotistical, enigmatic lawyer on the path of redemption. His character, unlike that of a straight protagonist, has shades of murky grey. He defends criminals for money, destroying innocent lives in the process. In real life Pawan Shankar, who quit a lucrative job at Essar Cellphone for modelling has debuted on television with Star One’s Siddhant. Understandably, he’s ecstatic that he has finally arrived on the small screen. "The story of the tainted lawyer has been told many times but here vice doesn’t meet a sticky end. Instead, I play a lawyer who is haunted by his conscience and becomes a champion of the poor, a Good Samaritan," says Pawan. Star One seems to have badly run out original scripts to lean for inspiration on The Practice—a show on its sister channel. And while Pawan may be ecstatic about his debut, he seems on a slippery wicket. Hope he doesn’t have to go back to where he started modelling. Every movie channel dreams of the day when evenings would be spent at home with a bag of popcorn and cola. And HBO seems to be striving for that. On February 11, it will be hard to resist going on a perilous quest to the centre of the earth with The Lord of the Rings: The Fellowship of the Ring. If you are a Tolkien fan, then get ready for a wild journey to destroy the ring that will save the world from the evil reign of the Dark Lords. The chosen ring slayer is Hobbit Frodo who along with Gandalf the wizard, Legolas the elf, Gimli the dwarf sets and Sam his faithful servant heads to Mount Doom. During the expedition, the team meets fascinating creatures and also has to dodge Sauron’s army, which is hot on its tail. 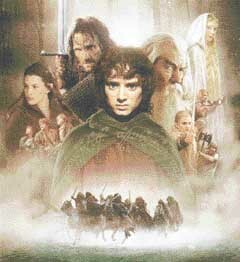 Sweeping the Oscars with awards for best cinematography, visual effects, music and makeup, and nominated in various other categories, including best picture director and supporting actor, the movie is the first part of Tolkien’s classic epic and a must watch for all those who enjoy the company wizards and occult. She’s a crossover girl in the true sense of the word. Natasha who is the Anjali in Kkavyanjali has been unobtrusively notching up success both on the small and big screens. The model-turned-star is on a rollercoaster ride ever since she played the lead in Kabhie Souten Kabhie Saheli on Star Plus. So impressed was Ekta Kapoor that she signed her on for Kuch To Hai and Krishna Cottage. And though both films turned out to be box office duds, Natasha’s star has been shining bright. Besides her teleserial Kkavyanjali, she has more than half a dozen films lined up for the year, including Vashu Bhagnani’s Silsiley, Tariq Anwar’s Ek Se Bure Do, Balaji’s Koi Aap Sa and a Tamil film Sukran. More than films, it’s the variety of roles that is making Bollywood take note. In Silsiley, she plays a bare-dare girl, in Ek Se Bure Do she does a comic cameo opposite Arshad Warsi and in Koi Aap Sa she pairs up with Aftab Shivdasani for a love story. According to Natasha, "Being a successful model gave me a tremendous high. But what excites me is the variety of roles." A role model, no doubt. For over two decades Elmo, Ernie, Slimey and Oscar the Grouch have been singing, dancing and teaching while walking down childhood’s most famous street. Sesame Street that’s been a part of growing up of millions of kids is all set to arrive in India. Cartoon Network and Pogo will produce Sesame India targeted at over 150 million urban public school kids under the age of six. Debuting in 2006, the series will feature new Indian Muppet characters, locally produced live action and animation segments and also the classic Sesame Street characters. In the first season, Sesame India will be in Hindi, though some English words will be incorporated. The series will subsequently be available in other languages. So, come 2006 and it’s show time for kids as the curtains go up for not just one of the longest-running shows in TV history but one that is considered by some as one of the world’s biggest educators as well.